Here we explain some of the geeky background theory stuff. If you just want to get into building the thing, you can skip ahead to the next page. Regardless whether you’re old enough to have played with Dad’s LP turntable, or have dabbled in digital audio programs on the newest modern PC, you’ve likely experienced some version of this phenomenon: take an audio recording that’s normally played back at one specific speed…and then change that speed, either compressing or expanding time…and the pitch of the audio changes along with it. Compress time and the pitch rises. Expand time and the pitch drops. Frequency is inversely proportional to wavelength. That’s easy with recordings…but with live audio, we don’t really have that luxury. Realtime is realtime…we can’t compress or expand it…it’s happening as it happens. What’s a would-be voice-changer to do? In digital music circles, granular synthesis is a technique of joining and layering lots of very short audio samples (or “grains”) — on the order of one to a few milliseconds — to build up more complex sounds or instruments. Now picture just a single “grain,” 10 milliseconds or so…and we continually refresh this one grain from a live microphone. By time-compressing or -stretching this one tiny loop, repeating or dropping short segments to keep up with realtime, we have the basis for a realtime pitch shifter. It really seems like this shouldn’t work…but it does! Speech waveforms tend to repeat over the very short term, and we can drop or repeat some of those waves with only minor degradation in legibility. This approach is totally suited to the Arduino’s limited processing power and RAM. The result isn’t going to be Hollywood quality, but it’s still vastly better than the majority of voice-changing toys and masks on store shelves. And you get to make it yourself…how cool is that? The frequency range of human voice covers about 300 Hz to 3,500 Hz (and harmonics may extend above this). The Nyquist sampling theorem states that a minimum 2X sample rate is needed to faithfully reconstruct a signal. For human voice, that means 7 KHz sampling…but a little more wouldn’t hurt. Repeatedly calling the Arduino’s standard analogRead() function in a loop is way, WAY too slow for this. We need to get deeper into the works of the Arduino’s analog-to-digital converter, fiddling directly with special registers and modes. A capability called free-run mode collects analog samples at a fast, fixed interval without repeated polling in our code. An interrupt handler is automatically called each time a new sample is ready, which happens like clockwork. Running full tilt, a 16 MHz Arduino can capture 9,615 10-bit samples per second. More than enough for sampling voice! Because our audio “grain” is relatively short (about 10 milliseconds), the RAM requirements should be fairly modest, a few hundred bytes. Problem is, we’d also like to continue doing those things that the Wave Shield was designed for — namely, playing back WAV files. That requires reading files from an SD card, and that in turn consumes lots of RAM. Fortunately the design of the WAV-playing code lets us gain access that library’s memory and recycle it for our own needs. The technical details are all well-commented in the source code. So if you’re curious about the specifics of this implementation…use the source, Luke! It can process the voice effect or play back WAVs (and can do both within the same sketch), but you can’t do both simultaneously. You can’t read other analog inputs when the voice effect is running (case in point, you can’t alter the pitch continually with a potentiometer). If using analog sensors as sound triggers (e.g. 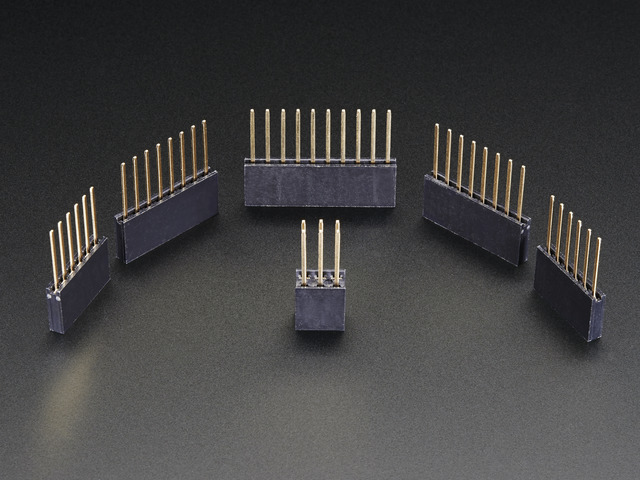 force-sensing resistor pads in shoes), consider work-arounds such as using a carefully-trimmed voltage divider to a digital input, or a second MCU to process analog inputs, forwarding triggers over a serial or I2C connection. We can’t emphasize this one enough: work through the original Wave Shield tutorial before moving on to the voice changer! This project has many separate parts, and a misstep with any one of them can stop the whole system from working. It would be tricky to debug the point of failure among all the possibilities. Invest a little time now to get the basic Wave Shield examples working — especially the “Pi speak” demo. This lets you know that the shield is properly assembled, the SD card properly formatted and so forth. Then we’ll add the extra features. Start by downloading the WaveHC library for Arduino…not only for WAV playback, but the voice changer relies on this code too. We have a tutorial explaining how Arduino libraries are installed. Download this ZIP file containing WAV files for the digits of pi. Then proceed through the tutorial until your Wave Shield is speaking them. With the basic Wave Shield working, now we can add the voice changer and a sound-triggering keypad. You can complete this phase on your workbench using a breadboard…we’ll make it portable later, after confirming that it works. Download the Adavoice sketch for Arduino. And you should already have the WaveHC library installed from the prior phase. The GND and 3.3V lines from the Arduino need to connect to several points, so you may want to a breadboard’s power rails for this. 3.3V from the Arduino should connect to the Electret Mic Amp VCC pin, one outside leg of a 10K potentiometer, and the Arduino’s AREF pin. 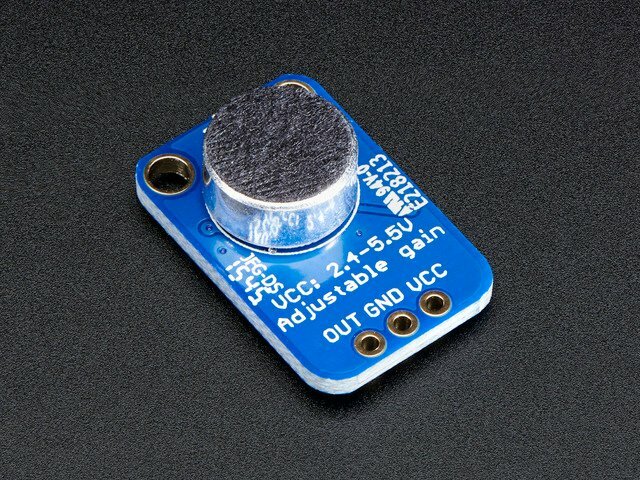 GND from Arduino should connect to GND on the Mic Amp and the opposite outside leg of the potentiometer. Don’t forget the AREF connection…the circuit won’t work without it! The Mic Amp output connects to analog pin 0, and the center leg of the potentiometer connects to analog pin 1. 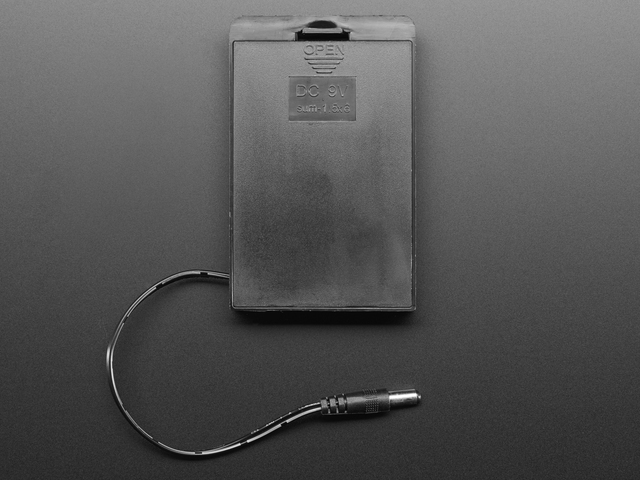 A small speaker can be connected directly to the Wave Shield’s amplifier output. For more volume, we recommend using amplified speakers such as the portable type for iPods and MP3 players, or our Class D Audio Amplifier breakout. 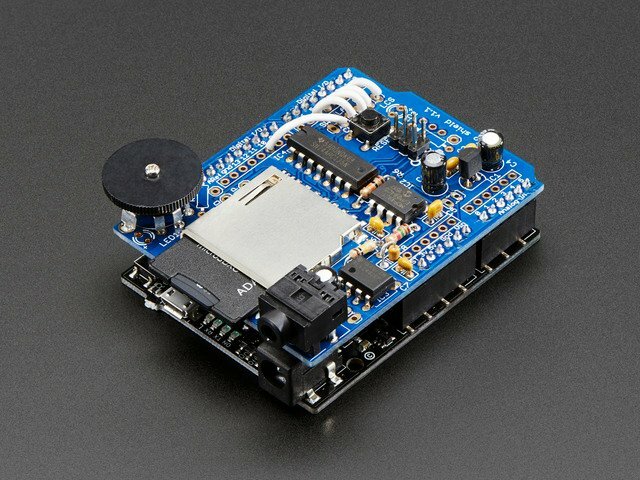 Upload the Adavoice sketch to the Arduino if you haven’t already done this. If everything is wired up and loaded correctly, you should head a startup chime when the sketch starts (if using an SD card with the sample WAVs). If there’s no sound, use the Arduino serial monitor and watch for diagnostic messages. Once up and running, you can then talk into the microphone and should hear the altered result through the speaker or headphones (keep the mic away from the speaker to avoid feedback). Pressing any of the keypad buttons will stop the voice effect to play the corresponding sound, then resume afterward. Note that the pitch dial does not work in real time! This is normal and a limitation of the way we’re running the analog-to-digital converter at full speed. To get a new pitch reading, you need to either play back a sound or press the reset button. To simplify the wiring diagram, we’ll illustrate this next section without the keypad. But you can still include it if you want! The connections are the same as above. 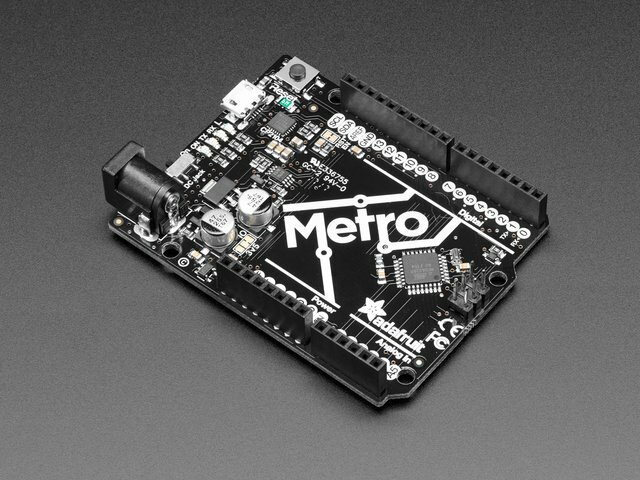 Because breadboard circuits are too delicate for portable use, we’ll join components directly this time. The Wave Shield can drive a small speaker on its own, but this doesn’t provide a lot of “oomph.” Parties and comic conventions are loud, so you’ll probably want a boost! We’re using our Class D Audio amplifier here with a pair of 4 Ohm speakers. Alternately, there are a lot of ready-to-go battery-powered speakers designed for iPods and other MP3 players that can plug right into the Wave Shield headphone jack. Using our own amp and speakers lets us custom-tailor the placement of all the parts. It’s best to power the Arduino and audio amplifier separately. During particularly loud moments, the audio amp can draw a lot of current, resulting in a momentary voltage “sag” causing the Arduino to reset. Giving the Arduino it’s own separate power supply prevents this. We’re using a 9 Volt battery connected to the DC barrel jack, or a 6X AA battery pack will last considerably longer. 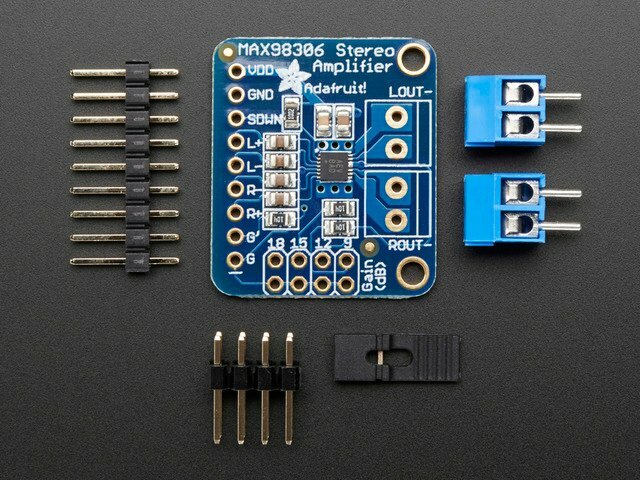 In any case, the ground connection is common between the Arduino and audio power sections, as well as the 3.3V part of the circuit (for the mic amp and trim pot). Here we’ve mounted all the parts on a sheet of acrylic using double-stick foam tape, then fastened this to a nylon strap so it can be worn over one’s chest. We chose tape for expediency only…give some thought to making your rig more durable, using mounting screws, zip ties, etc. You can run the microphone connection a couple feet to reach inside a mask or helmet. A servo extension cable provides a very handy 3-conductor separation point, so you can pop your head and set it down! Cut the servo cable in half, soldering one end to the mic amp board and the other side to the Arduino circuit. This guide was first published on Oct 10, 2012. It was last updated on Oct 10, 2012.